On Saturday my husband and I got up early and headed down to South Carolina for some treasure hunting. 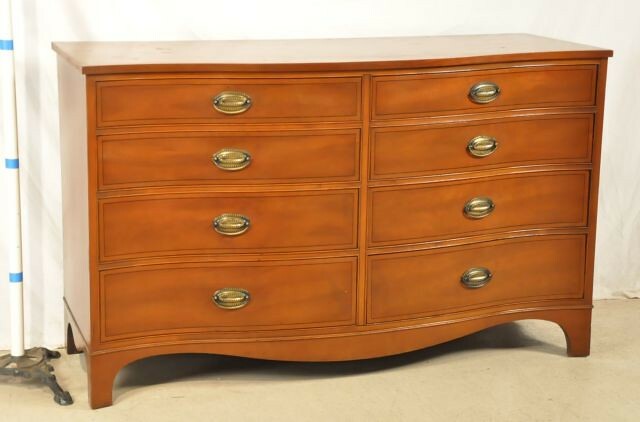 We went to our very first auction to find a dresser for our master bedroom. It was SO FUN. I am going to have it professionally painted. 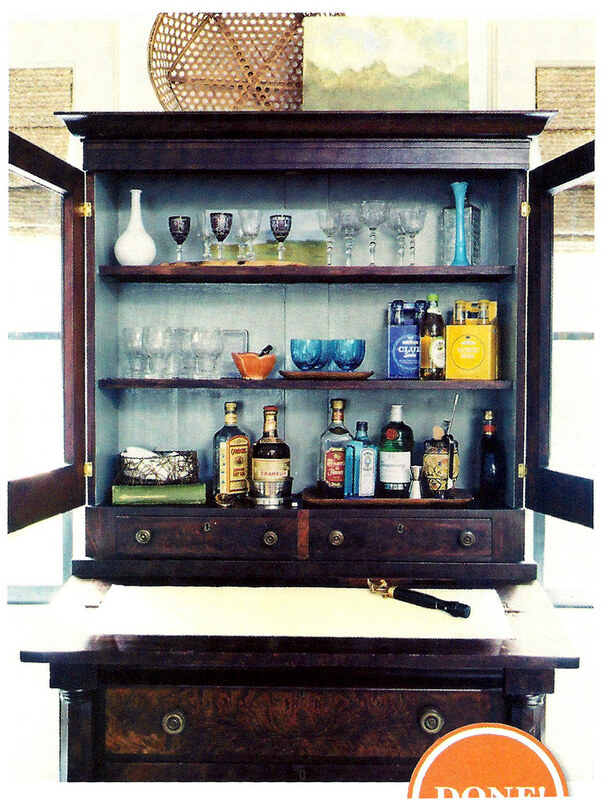 It may be a sin to paint an antique, but it can always be refinished and stained later down the road. 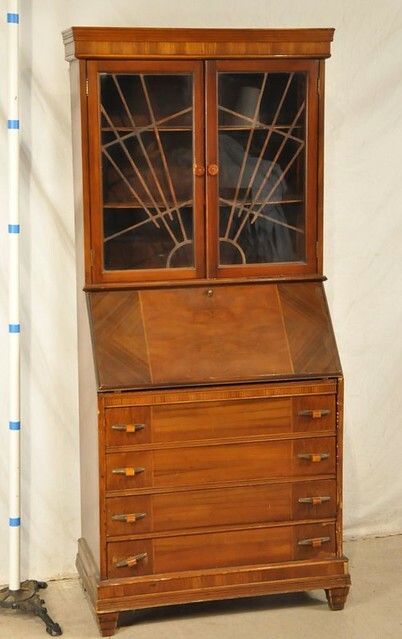 I also won this awesome art deco secretary. Look at that inlay and glass front detail!!! I had to have it. I just need to give her some TLC and she will be good as new. After the auction, I headed to the Habitat for Humanity Re-store. Mr. 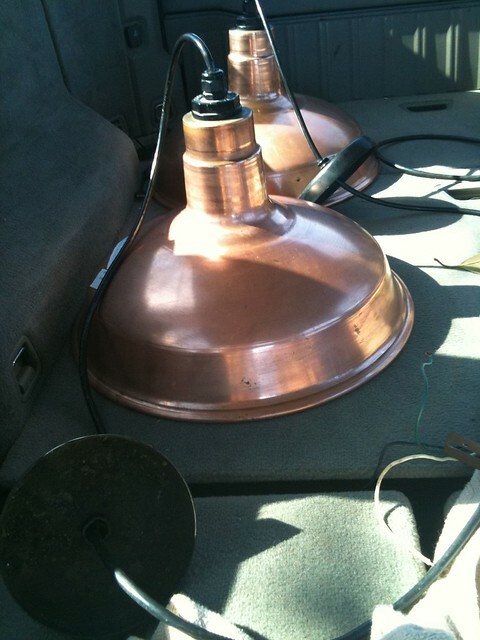 Goodwill Hunting posted on twitter some amazing copper pendants for $60. I gasped and knew I had to go and pick some up. I haven't decided where to put them yet. Either in our upstairs hallway or maybe our kitchen. Probably the hallway though, because we need more overall light in the kitchen. Good Lord...you scored with the chest and secretary...and then to top it all off with the pendants! Love everything. KEEP the secretary!! It's absolutely gorgeous. And those pendants...lucky girl! Love, love the secretary! I wish I had room for one too. I'm glad you've decided to keep it for yourself! Gorgeous finds Bryn! Can't wait to see all the transformations. 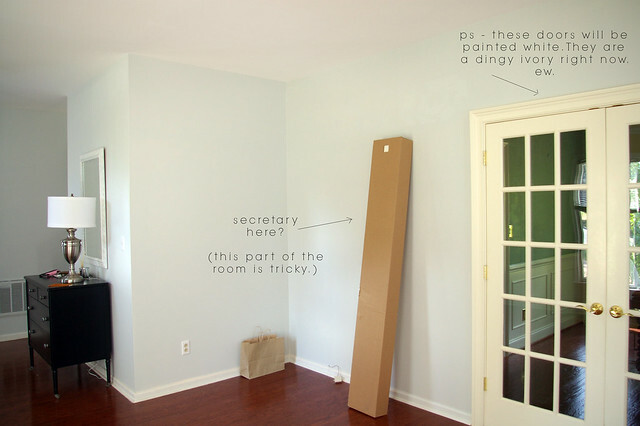 oooh I love the idea of wallpapering the inside of that secretary. Can't wait to see what you do - you simply must keep it for yourself! Score on the great finds! Can't wait to see what you do with them. I'm sure it will be beautiful! Wow ! That art deco piece is fabu ! Can't wait to see the makeover. Great pieces, Bryn! I've been pondering a road trip to those SC auctions - let me know the next time you head down! I wanted to see where in South Carolina you went. I live in Charleston and am always looking for fun places to explore. Love all your stuff. I can't wait to see what you do with the secretary. I inherited one from my grandmother that needs a little love! I cant wait to see how you update the secretary and I totally think you should keep it for yourself! Cheers! Fabulous finds. I'd love to try out an auction one day. longhorn, out of context, who would have thought:) good finds! Great scores! The copper pendants, oh my! surfed to your blog from Japan and added to one of my fav blogs list! two thumbs up on the copper pendants, I love your blog! Those are some amazing finds! I can't decide what I like the most: the pendants might be my favorite pieces of all!